Immersive experiences that leverage the capabilities of the human visual system typically seek to support the following capabilities: depth perception through stereopsis, engagement of peripheral vision, high visual acuity. Achieving this within real-time synthetic environments, such as a game engine, involves a means of presenting two rendered views to each eye, tracking the viewer within the space and supplying a sufficiently wide field of view at a high resolution. Presenting real-world photographically derived imagery meeting these requirements is considerably more problematic. For example, a photograph or video only captures a scene from a particular position whereas a computer generated rendering of a scene can be generated at will from any position. 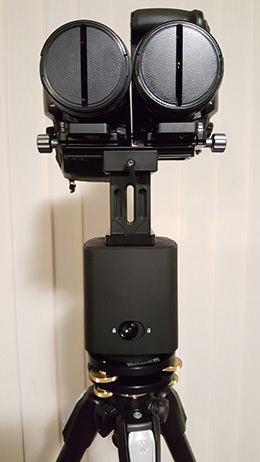 A so called omnidirectional stereoscopic panorama (ODSP) is a well established technique of capturing a 360 degree field of view stereoscopically. Strictly speaking the ODSP is only an approximation to the correct stereo pairs that should be presented to the viewer, but it an approximation that has been born out to be acceptable when the correct views cannot be created synthetically. A number of cameras have been proposed and constructed to capture an ODSP, in the following we will present the latest development, an approach due largely to the evolving capabilities of consumer level cameras. 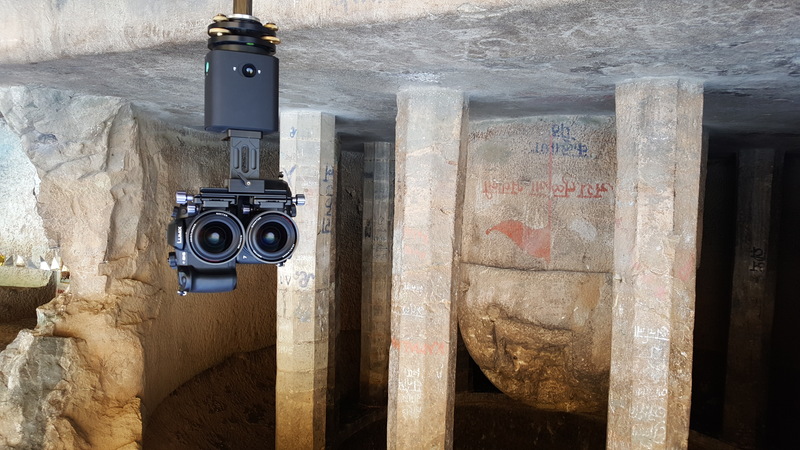 Omnidirectional stereoscopic panoramas (ODSP) is the term given to a pair of locally correct stereoscopic panoramas spanning 360 degrees in longitude. "Locally correct" because if a limited horizontal field of view of the ODSP is presented to a viewer, there are minimal perceived stereoscopic artefacts irrespective of the part of the panorama being viewed. This is in contrast to more traditional stereoscopic image pairs that require knowledge of the viewers position to be strictly correct. In practical terms this means that an ODSP can be presented in, say, a 360 degree cylinder containing multiple observers all potentially looking in different directions. Similarly an ODSP can be experienced within a virtual reality (VR) headset with no other view dependent computation than selecting the correct portion of the panorama image pair as the viewer turns their head. In contrast, for most VR environments the exact view presented to each eye needs to be computed for all viewer positions and view directions. While this can be achieved for real time rendering, it is not possible for photographically captured imagery or computer based rendering or visualisation that cannot be computed in real time. The theory behind the ODSP was variably introduced in the 1990s by Ishiguro et al and various camera and software designs published by Peleg including an option employing a single camera. Employing an ODSP provides for the presentation of stereoscopic photographic imagery while minimising departures from the exact image pairs that should be presented to each eye. There are two sources of error, the first arises when the viewer is not located in the same position in relation to the viewing apparatus as where the ODSP was captured. For example if the viewer is not located in the center of a cylindrical display environment, or in the context of a VR headset the viewer is not located in the center of the virtual cylinder on which the ODSP is the texture map. The second error is the divergence from the ideal stereoscopic image pairs from their respective vertical centers. That is, the stereoscopic perception is perfectly correct in the center of the view direction and gets increasingly distorted towards the left and right edge of the field of view. Fortunately the effect of this error is rarely an issue. One reason is that the glasses being employed in stereoscopic systems typically limit the horizontal field of view to about 60 degrees. While this may seem like an impediment to immersion through peripheral vision, our depth perception is limited naturally due to occlusion by our nose, and thin frame stereoscopic glasses can still provide peripheral vision in the far field outside the frame of the glasses. Another reason for minimal impact of the stereoscopic error with angle is that humans naturally fixate and align their heads with their view direction. Direct implementations of an ODSP camera have been built by Seitz as early as 1955. In 1997 they released the "Roundshot Super 70" and based upon that a limited edition of dual camera rigs were constructed that captured true continuous ODSP. Continuous because a pair of film rolls were exposed while the camera shutters remained open and the twin camera rig rotated. Typically the ODSP pairs were drum scanned and the resolution was well in advance of most presentation systems, this is still largely still true today. However, the future of both the film stock and the quality scanners to scan to digital format is increasingly putting pressure to finding a digital alternative. Not to mention this particular camera has been out of production for some time. 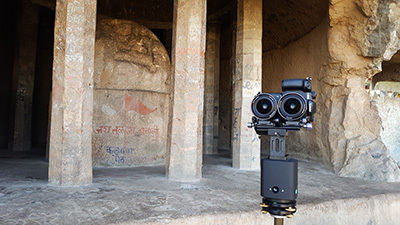 Roundshot camera in the field, India. One alternative is to acquire a relatively small number of photographs from two offset cameras and combine them into a panorama using well established monoscopic panorama stitching software tools, see the following figure for the top-down view of the camera frustums for an eight camera system. Note that two cameras necessarily violates the usual rotation about the zero parallax position of the lens. While this approach in practice can often give acceptable results, and it can be extended to video recording by employing multiple video cameras rather than a rotating rig, it does have limitations. The first issue involves parallax error, that is, between the two adjacent camera positions slightly different views of a scene object are recorded. The consequence is that a perfect stitch is not possible, noting that it is possible for a particular depth but not all depths at once. The second issue is that between adjacent camera positions one camera is closer to scene objects than the other resulting in the same effect as a change of zoom across the boundary between the cameras. The consequence as for the parallax issue is a difficulty creating a perfect stitch across the overlap zone, these errors generally reveal themselves for close objects in the scene. In practice, with sufficient overlap modern machine vision techniques can identify feature points between the cameras and form two apparently seamless panoramas. However to achieve those results these algorithms often employ local warping, this amounts to a depth distortion in those regions as well as differences between the visible scene objects, both often very noticeable when viewed in a high quality stereoscopic viewing system. The upshot are image discontinuities that are often more apparent when viewed as stereoscopic pairs compared to viewing panoramas monoscopically. Due to the recent resurgence in head mounted displays a wide range of sophisticated algorithms have been developed to address these problems, or to at least hide them. This includes seam line and image cuts along feature curves, shape interpolation, optical flow and many more. While these techniques each find applications in some situations, they are generally designed to hide the obvious image flaws which would inevitable arise. They each have situations in which they fail. 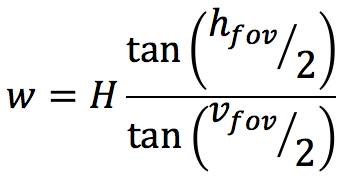 The difference between the perfect ODSP and a finite number of cameras is a matter of the degree of discretisation. The authors, and others, have experimented with manual rotations of a camera in ever decreasing small stepping angles between each shot. At some stage for practical purposes one requires a motorised system, even at 3 degrees there are 120 individual camera shots per camera and if performed manually the scene is almost certainly going to change over the duration of the capture. Narrow strips from each video frame contribute to the final panorama image. The size of the angular stepping depends on the degree to how narrow the parallax zone in figure 2 needs to be, and for the zoom error how close objects can be to the camera. For interior scenes tested by the authors, even 1 degree steps were not small enough. In essence both effects need to result in less than one pixel difference across the edge between adjacent image slits. At this point it was decided that manual discrete stepping was inadequate and a continuous rotating system was required, recording not still photographs but video. 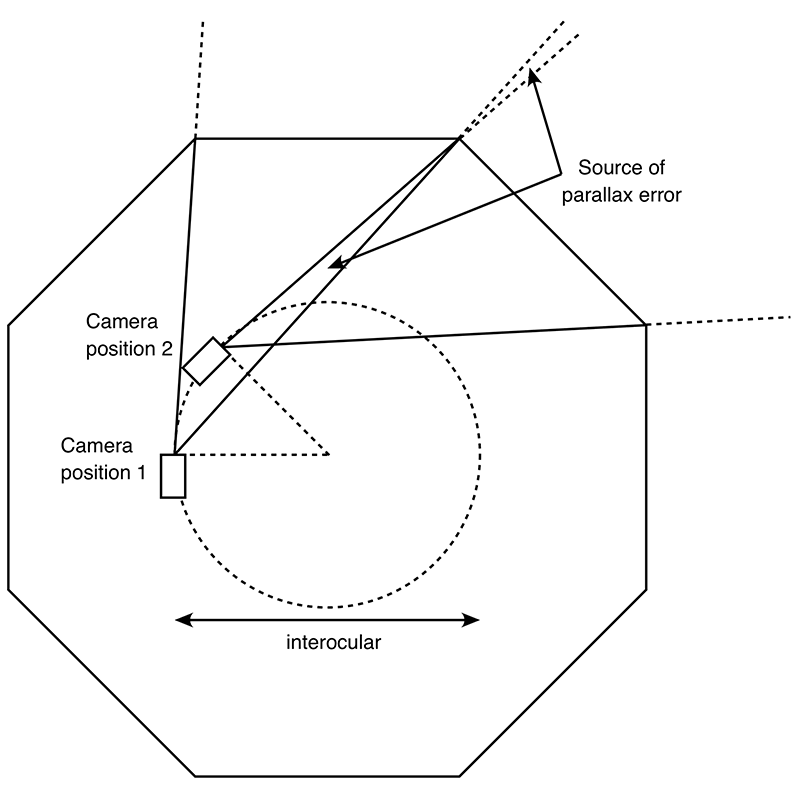 While not discussed further here, the possibility of recording from a single perpendicular offset camera was explored. It holds some advantages, for example, the ability to choose the interocular separation in post production and the need for a single camera saving costs and possible colour or optical differences between two cameras and lenses. In reality in order to achieve human eye separation the tangentially rotating camera needs to be further off center than for a pair of cameras. This not only introduced mechanical strains on a rotating system, it also exasperates the parallax and zoom issues discussed above. 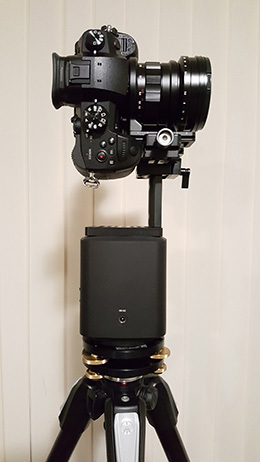 The camera body and lens should not be significantly more than 6.5cm so that the ODSP can be created at, or close to, typical human eye separation. For the panorama quality sought it was decided that a 4K high panorama was required, so a 4K recording mode is required. The number of discrete steps is largely determined by the capture time and the frame rate of the video. Capture rates of 20fps or greater have proved to be adequate. Since video modes are required in order to achieve (3) and (4), it is desirable that the movies have the greatest colour depth possible and recorded with minimal compression artifacts. In the first quarter or 2017 Panasonic released the Lumix GH5 camera which possessed many of the desirable features listed above and making it a cost effective candidate for a high quality ODSP rig. Specifically, it was able to record at full 4K wide, at acceptable frame rates, at 10 bit and minimally compressed 4:2:2 video. The shooting modes of the Lumix GH5 relevant to this discussion are listed in the following table, only the 4K and UHD 10 bit modes with 4:2:2 compression are shown. Noting that these modes are subsequent to the firmware release in late 2017. It is therefore possible to trade-off resolution and slit width (function of frame rate) for dynamic range and image quality. The mode chosen for this work is the third hilighted row, a true 4K high sensor resolution, 24 fps, 10 bit colour and 4:2:2 compression. The next candidate would have been 29.97 fps at 3840 pixels, this would lower the panorama resolution but provide narrower slit widths. Note that the camera does support both higher resolution and higher frame rates but at the price of image depth and compression. 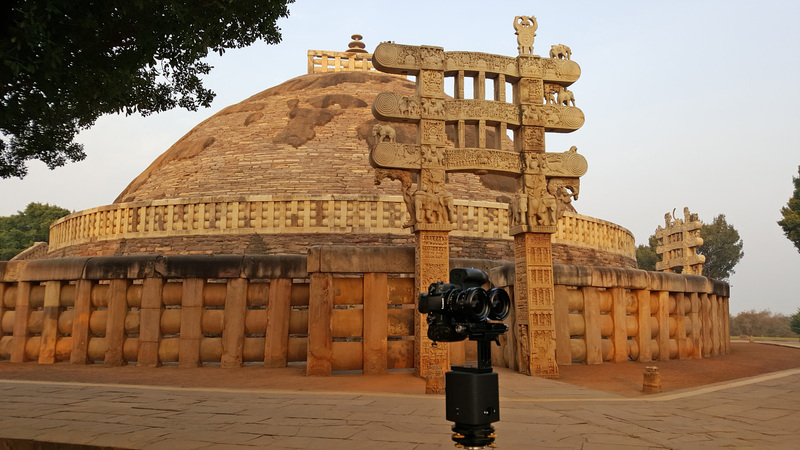 In order to achieve a 4K high panorama the cameras are orientated in portrait mode, a custom lens based clamp was engineered in order to create the minimum interocular distance possible. Consideration was given to orientating the cameras at an angle in order to increase the vertical resolution by using a diagonal slit rather than a vertical slit. This was not implemented mainly because for the aspect ratios used the gain was only a modest 15% and it considerably complicated (and possibly compromised the quality of) the post production. Different views of the prototype camera rig. 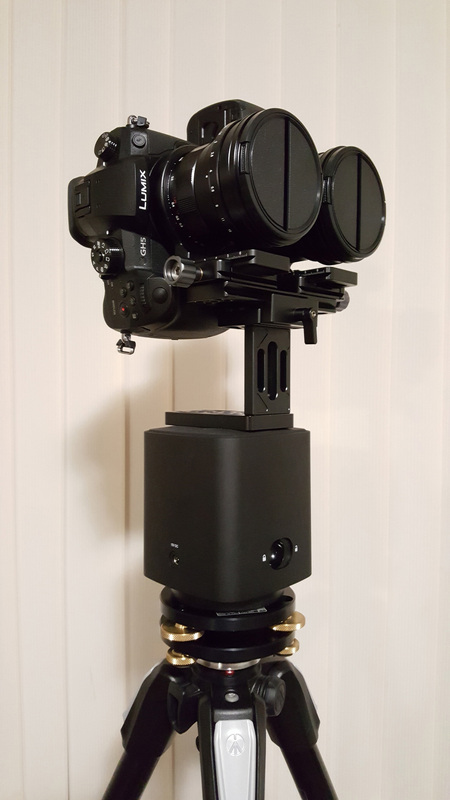 Syrp motorised unit, Manfrotto levelling ring, dual GH5 cameras, custom lens mount. The straightforward method of forming each of the final panoramas is to simply extract slits from each video frame, assembling them literally as shown in the figure above. In practice a slightly wider slit is chosen and adjacent slits blended together across the overlap region. where vfov is the vertical field of view of the lens and H the height in pixels of the frame. The following table lists typical slit widths for a selection of lenses and camera recording modes. Note that the vertical field of view may be different to that predicted theoretically since the different camera modes can use different regions of the available sensor area. This also illustrates the advantage of choosing a lens that is the least required for a particular application in order to maximise the horizontal resolution. Example slit widths for a selection of lenses and camera modes. This direct slit approach has a number of disadvantages, one is that it makes antialiasing problematic when, for example, one wishes to map the input frames to a higher or lower resolution panorama. The other issue is that the ideal number of pixels per slit is generally not an integer, and yet only integer slits can be extracted. While this can be a minor effect for wide slits, in the work here the desire is to approximate the continuous case as much as possible so very narrow slits are used, usually between 5 and 15 pixels. The more elegant solution uses the approach employed in most image mappings, that is, one considers each pixel in the output image and estimates the best pixel from the input images. Using this algorithm antialiasing is straightforward, that is, each output pixel is supersampled with the contributing pixels from the input image averaged together. This additionally serves to increase the dynamic range of the result and naturally handles estimates close to the shared edge of slits from adjacent images. from multiple images and multiple pixels within an image contributing to the final value. This can seem counterintuitive but the reason the arises is because the vertical field of view of the lens is spread across the available pixels vertically resulting in a certain degrees per pixel. For square pixels this dictates the number of horizontal pixels across the 360 degrees horizontally. As such narrow vertical field of view lenses result in the highest panorama resolution horizontally. This is for a cylindrical panorama, as vfov tends to 180 degrees a cylindrical panorama becomes increasing inefficient. In the same way as a perspective projection becomes increasingly streched and inefficient as the field of view approaches 180 degrees (actually around 130 degrees). For a high vertical field of view ADSP a fisheye lens is more appropriate, this is outside the scope of this discussion. The final pipeline is as follows. After setting up tripod and careful levelling of the camera rig, video is captured simultaneously on each camera. The rotational angle captured ranges from 400 degrees (provided ample overlap for blending across the 0-360 edge of the panorama) to 720 degrees (maximum allowed by current motorised rotator). The reason for 720 degrees (two rotations) is to provide scope to correct for unexpected moving objects, typically people and birds. Each video file is transferred from camera to computer and the sufficient slit width is extracted from each frame to enable sampling into the final panorama. This is largely a storage efficiency step, there is not point saving the entire frame since only a small fraction of the pixels in each movie frame are required, for example 15 pixels out of the available 2180. The two panoramas are assembled by either the forward or reverse mapping method. The software requires various parameters relating to the camera, lens and recording mode. Three columns on each of the final two panoramas are identified, they are the left and right edge for wrapping across the 0 and 360 boundary, and a column identifying an object to be at zero parallax. A solution outside the scope of this paper is used to perform the clipping, blending and zero parallax alignment. 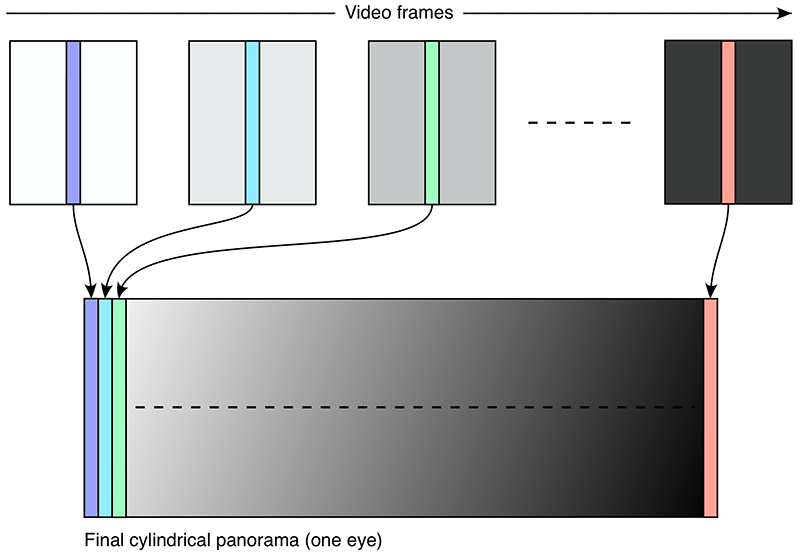 Note that the zero parallax alignment depends on the final viewing environment, for example it depends on the radius of the cylindrical displays for projected environments, it would be set an object at infinity for head mounted displays. Colour grading before reducing the RGB values to 8bit for the final presentation system. All the processes above are conducted in 16bit colour, capturing the 10bit colour from the camera footage and any increase in dynamic range from blending and/or antialiasing in the composition of the panoramas. Typically only the outcomes from stage (2) and (3) would be archived as the original source material. (2) so that any subsequent algorithm improvements can be reapplied to the footage. (3) so that any editing (image size, colour, zero parallax) can be reapplied. Example capture with a 20mm lens, vertical FOV of 48 degrees. Final stereo panorama width of 30,000 pixels. Note: zero parallax set for a 5m radius cylindrical display, not a HMD. Top: left eye. Bottom: right eye. Camera in the field in India, note the lens holder slits are not attached since the sun is not in shot. Example capture with a 10mm lens, vertical FOV of 75 degrees. Final stereo panorama width of 17,000 pixels. Note: zero parallax set for a 5m radius cylindrical display, not a HMD. Top: left eye. Bottom: right eye. H. Ishiguro, M. Yamamoto, and S. Tsuji, Omni-Directional Stereo, IEEE Transactions on Pattern Analysis and Machine Intelligence, Vol. 14, No. 2, pp. 257-262, February 1992. 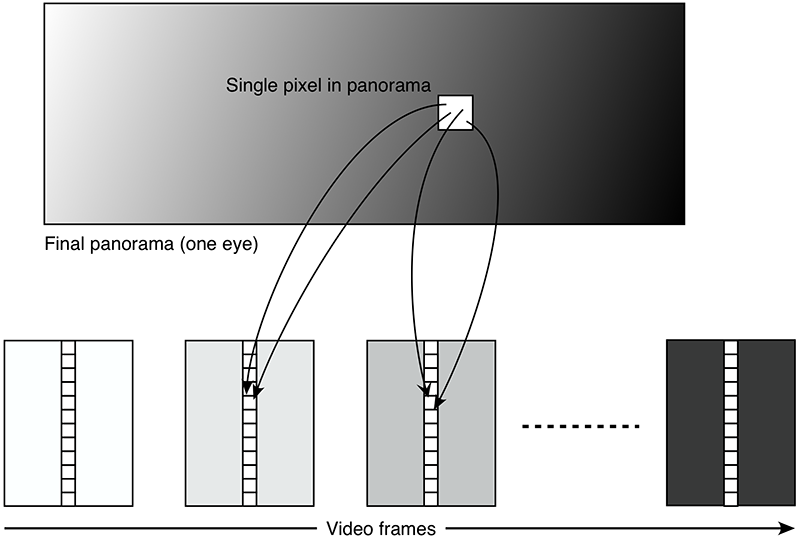 H. C. Huang and Y. P. Hung, Panoramic Stereo Imaging System with Automatic Disparity Warping and Seaming. Graphical Models and Image Processing, Vol. 60, No. 3, pp. 196-208, May 1998. Y. Pritch, M. Ben-Ezra, S. Peleg. Automatic disparity control in stereo panoramas (OmniStereo). Proceedings IEEE Workshop on Omnidirectional Vision (Cat. No.PR00704). 12 June 2000. DOI: 10.1109/OMNVIS.2000.853805. Print ISBN: 0-7695-0704-2. Y. Pritch., M. Ben-Ezra, S. Peleg. (2001) Optics for Omnistereo Imaging. In: Davis L.S. (eds) Foundations of Image Understanding. The Springer International Series in Engineering and Computer Science, vol 628. Springer, Boston, MA. R. Aggarwal, A. Vohra, A. M. Namboodiri. 2016. Panoramic stereo videos with a single camera. In Proceedings of the IEEE Conference on Computer Vision and Pattern Recognition. 3755-3763. doi>10.1109/CVPR.2016.408. J. Lee, B. Kim, K. Kim, Y. Kim, J. Noh. 2016. Rich360: optimized spherical representation from structured panoramic camera arrays. ACM Transactions on Graphics (TOG) 35, 4 (2016), 63. C. Richardt, Y. Pritch, H. Zimmer, A. Sorkine-Hornung, Megastereo: Constructing High-Resolution Stereo Panoramas, Proceedings of the 2013 IEEE Conference on Computer Vision and Pattern Recognition, p.1256-1263, June 23-28, 2013 doi>10.1109/CVPR.2013.166. S. Peleg and M. Ben-Ezra, Stereo Panorama with a Single Camera. Proc. IEEE Conf. Computer Vision and Pattern Recognition, pp. 395-401, June 1999. S. Peleg, M. Ben-Ezra, and Y. Pritch. Omnistereo: Panoramic Stereo Imaging. IEEE Transactions on Pattern Analysis and Machine Intelligence, Vol. 23, No. 3, pp 279-290, March 2001. McGinity, M., Shaw, J., Kuchelmeister, V., Hardjono, A. & Del Favero, D. (2007) AVIE: a versatile multi-user stereo 360° interactive VR theatre. In Proceedings of the 2007 Workshop on Emerging Displays Technologies: Images and Beyond: the Future of Displays and interaction (San Diego, California, August 4 - 04, 2007). EDT '07, vol. 252. ACM, New York, NY. Alexa M., Cohen-Or D., Levin D. As-Rigid-As-Possible Shape Interpolation; Proceedings of the International Conference on Computer Graphics and Interactive Techniques Conference (SIGGRAPH); New Orleans, LA, USA. 23–28 July 2000; pp. 157–164. Li L., Yao J., Lu X., Tu J., Shan J. Optimal seamline detection for multiple image mosaicking via graph cuts. ISPRS J. Photogramm. Remote Sens. 2016; 113:1 – 16. doi: 10. 1016 / j.isprsjprs .2015.12.007.